(L-R) The day’s cleaning crew included Robin, Batman, Wolverine, Spider-Man, Iron Man and the Hulk. 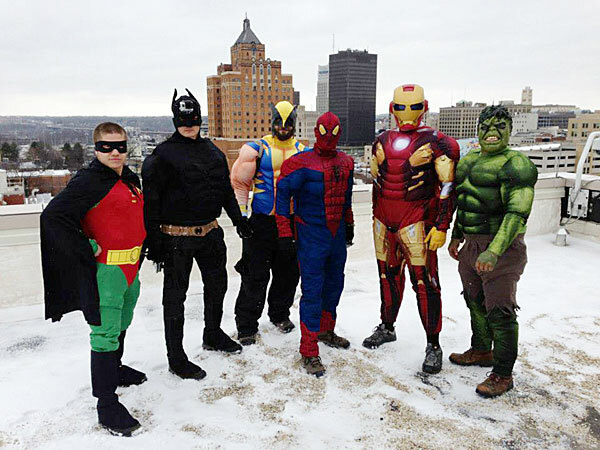 The patients at Akron Children’s Hospital got a super surprise last Friday morning as a team of six super heroes rappelled down the hospital’s towering windows, peeking in as they washed windows for all to see. 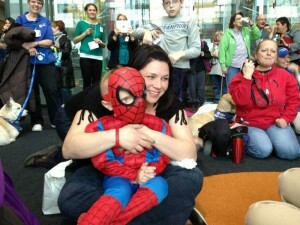 A Young Spider-Man sits with his mom and others in the atrium lobby to watch his hero wash windows. A large group of patients, parents, doctors, nurses, child life specialists, volunteers and even members of the Doggie Brigade gathered in the atrium lobby for one of the best window views. Anticipation built as they saw the long ropes move, then caught a glimpse of a black cape. Finally, they got their first look at the masked men. But a wave from Batman and a salute by Spider-Man, followed by a quick descent got the biggest cheers. After braving 30-degree temperatures for about an hour, Iron Man led his team inside the hospital, where they visited kids on the pediatric intensive care unit, childhood cancer floor and neonatal intensive care unit. “I’m having a blast, man. This is the best day of work ever,” Robin was overheard telling Batman as they visited kids throughout the hospital. The special visit was made possible by American National Skyline Inc. (ANSI) of Cleveland, the company that’s been cleaning the windows at Akron Children’s for at least 15 years. Special thanks to Daryl Oehlstrom, ANSI operations manager (Iron Man), Rob Ule (Wolverine), Mark Elliott (Spider-Man), David Boles (The Incredible Hulk), Anthony Mikols (Batman) and Tony Bernardi (Robin) for an action-packed morning! Watch this news segment from WEWS TV-5 and check out our photo gallery below.